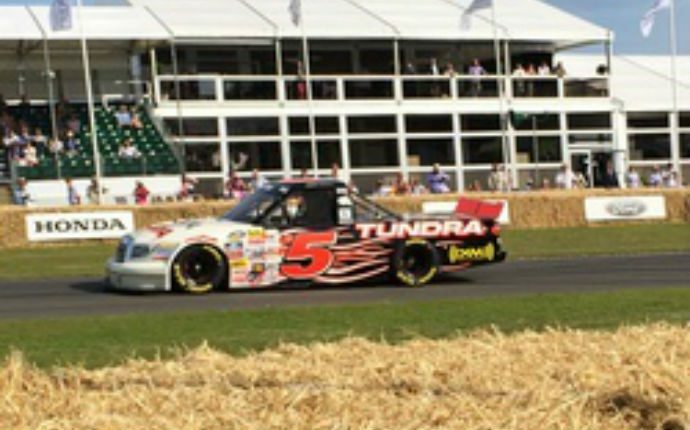 WEST SUSSEX, England (June 29, 2015) – Former NASCAR Camping World Truck Series champion Mike Skinner was back to his winning ways on Sunday as he broke his own record time for the NASCAR class of competition at the iconic Goodwood Festival of Speed. After damaging his primary truck on Saturday afternoon, Skinner entered the final round of competition driving the 10th Toyota Tundra racecar ever built. He paced the race against the clock for the NASCAR division to beat the record time he set in 2014 by more than half-a-second and was identified as the “Driver Of The Day” at the 2015 Goodwood Festival of Speed, making for a storybook ending for the American NASCAR driver on his birthday. Participating in his fifth Goodwood Festival of Speed event, Skinner had to overcome adversity throughout the weekend en route to his record setting run. Skinner was originally slated to compete in the No. 5 Cessna / Remington Toyota Tundra, but that truck sustained competition-ending damage when it made contact with the chicane during Skinner’s Saturday morning practice run. As a result, Skinner’s teammate and business partner, Andrew Franzone handed over the wheel of his historic Toyota Tundra entry to enable Skinner to make a timed-run in the final round of competition on Sunday afternoon. Climbing back in the truck he nicknamed “Old Faithful,” Skinner recorded a 50.22-second lap to improve his 2014 record time by more than half-a-second. In a tight competition, Skinner’s small team, composed of Chris Paulsen of C&R Racing, and Jamie and Dustin Skinner of Racecar Solutions, brought home a 0.05-second win against some of the most successful teams in NASCAR. The effort earned Skinner the “Driver Of The Day” title for the first time in his Goodwood career.